ClearBooks accounting is considered to be among the league of best accounting software which are present in the market. It is specifically designed to make accounting and other corresponding actions less time to consume for businesses. This allows the businesses to focus and spend their time and effort on other departments. 1. 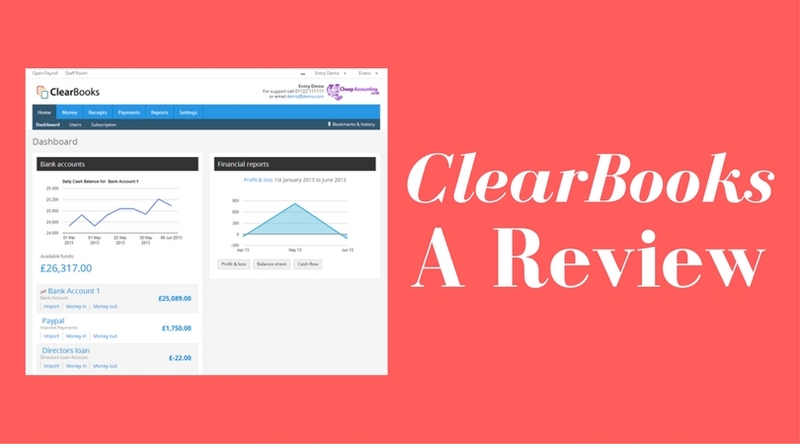 ClearBooks provides a greatly customizable dashboard which makes it quite navigable and user-friendly at the same time. 2. This software comes with a huge variety of important accounting tools and functions along with easy-to-use procedure which makes it the perfect choice for new users. It also makes the learning curve shorter as these users can easily learn and take full advantage of this software along with its features. 3. It consists of a wide spectrum of features like multi-currency handling, direct debit integration, payroll, HR and much more. 4. Its monthly subscription comes with support based on telephone, email along with live chat support and community too. This allows the users to get the solution of their queries as per their comfort level with the various support structure. 5. In case you have only basic requirements then you can get a low-cost version, but most of the people will have to go with Together+ package. In this case, they have to pay an additional amount for certain features too. 1. ClearBooks is quite a good choice for small businesses as it speeds up the accounting operations with its user-friendly dashboard and a wide variety of tools. 2. You can easily create professional looking customized invoices within few minutes, and this allows the customers to pay instantly. 3. The purchases and expenses provide you to enter the entire details related to money that you owe to suppliers. 4. From basic reports to a wide array of finance related reports such as balance sheets etc. comes with advanced reporting like audit logs or trial balance reports. 5. You can easily access your accounting data at anywhere you wish too. 1. It took considerable time and associated complex process when it comes to basic transactions. 2. Its profit, loss and balance sheet are not laid properly and doesn’t provide the user to drill down through it. All in all, ClearBooks has significant features which easily fit with requirements of small businesses. It allows the user to create invoices within few minutes. But the downside of this software lies in the time consumption and complexity of tasks when it comes to basic transactions. Still, if you go with this software, then do let us know your experiences. Also, mention your suggestions and reviews in the comment section below.